Cross-border ecommerce—buying digitally on foreign sites—is increasing in popularity with both retailers and consumers. One of the biggest forces driving growth has been the rise of marketplaces. Unfamiliar brands are making headway through partnerships with trusted global retail platforms. China, with its growing digital buyer penetration rate and behemoths like Alibaba that attract price-sensitive buyers from around the globe, dominates cross-border ecommerce in Asia-Pacific. In the European Union, initiatives like Single Euro Payments Area (SEPA), which simplifies bank transfers in euros, and new regulations that prevent geoblocking have stimulated cross-border buying. In Latin America, low credit card usage and a lack of strong infrastructure and delivery systems hold back digital commerce in general, as well as cross-border buying. Per Payvision, merchants in North America were least likely to have a cross-border strategy (62%), and consumers in the region’s two countries behave very differently. Buying on foreign sites is more common in Canada than the US. 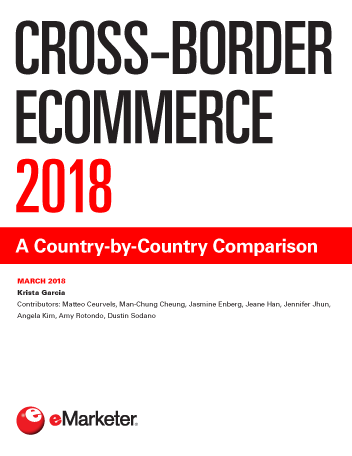 "In 2017, over 80% of retailers worldwide agreed that cross-border ecommerce has been profitable." What Are They Buying Abroad? How Do Cross-Border Buyers Behave? Where and What Are They Buying?